Have there ever been such hotly contested tickets as those for the Leonardo da Vinci exhibition, currently showing at the National Gallery in London? The premise of the show is to bring together, for the first time, the genus of work created by Leonardo whilst based at the court of Duke Lodovico Sforza. Leonardo worked in Milan between 1482 and 1499, and this exhibition includes almost every surviving picture painted during this time. Among them are a few stellar paintings which have never been hung together before, including the two versions of The Virgin of the Rocks painted some twenty years apart. 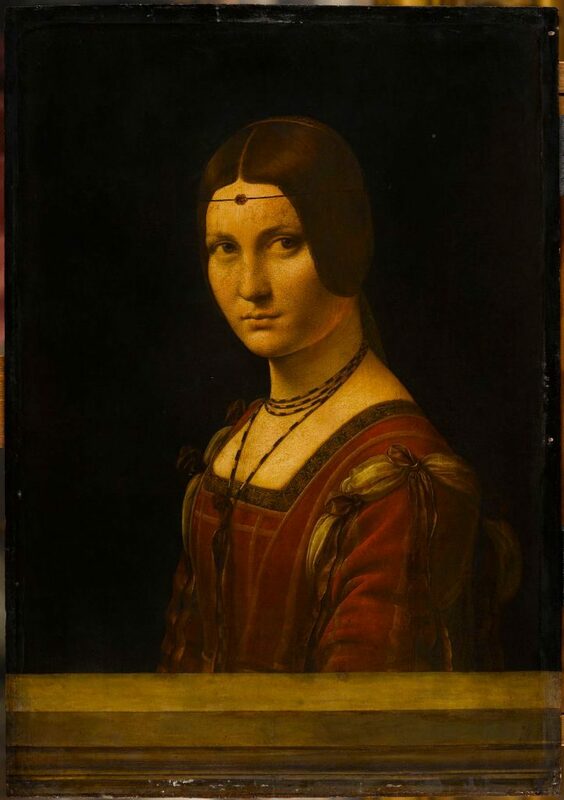 This is also this is the first opportunity for art-lovers to see the recently re-discovered Salvator Mundi, one of only fifteen authenticated extant Leonardo da Vinci paintings. Of particular interest to modern secular tastes, the portraits of the Lady with the Ermine, and the Belle Ferronnière are essential viewing. Much has been written about the Lady with the Ermine: it is believed to be the portrait of Cecilia Gallerani, Ludoviko’s mistress, and painted in 1488–90. 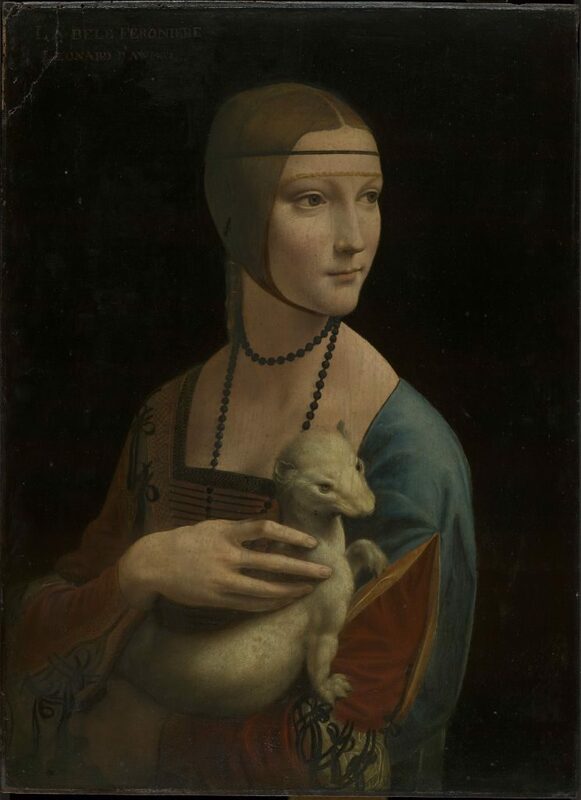 In placing the oversized ermine into the hands of Cecelia, Leonardo is making a number of puns; the Greek name for Ermine is Galay, a play on her name; and Ludoviko Sforza had been granted the Order of the Ermine by the King of Naples, and was known by the nickname, ‘l’Ermellino’. Cecelia was sixteen at the time of the painting, and the Ermine emphasizes her youth and innocence. Leonardo wrote of Ermine as a symbol of purity and honour. Inversely, some readings put the ermine in her hands as a reference to her impending pregnancy with Ludoviko’s son. By contrast La Belle Ferronnière is a much more enigmatic and idealised portrait. The sitter has not been identified conclusively, but may be Ludoviko’s wife, Beatrice d’Este or Lucrezia de Cribellis’, a mistress who bore Ludoviko two sons. The painting’s current title was given to it during the 17th century and is thought to refer to the mistress of Francis I of France, who was married to a ferron (feronnier is the French word for an ironmonger). With paintings of this age, it is inevitable that some become associated with a number of different people. In the exhibition the paintings are hung on adjacent walls, which creates the effect of the Belle Ferronnière gazing at the Lady with the Ermine, who in turn looks beyond the audience to a third point in the room. Cecilia engages with some unknown viewer, eyes turned slightly to the right as though in conversation. Her expression is open, as though listening with intent. By contrast, the Belle Ferronnière is separated from us by the parapet, as though on a sculptural plinth. She is more distant, less attainable than the open Cecilia. The shape of her head shows a greater nod to the ideals of geometry and her clothing is richer than Cecilia’s, suggesting a woman of higher nobility. This is a rare opportunity for us to compare both portrait styles. Other notable inclusions in the exhibition are the two versions of the Virgin of the Rocks. Given the scale of both paintings, they have been hung some distance apart. The painting to the left as you enter is the Louvre copy, and the first version of the subject, commissioned by the Confraternity of the Immaculate Conception. On the opposite wall, the newly renovated National Gallery copy includes a number of Leonardo’s re-workings of the original theme. The gesturing messenger of the first painting is here an angel, and the supplicant John the Baptist has gained his familiar attributes. The Virgin Mary is much more idealized than in the first version, da Vinci having had two decades in which to develop his style. The subjects are also crowned with their nimbi, at a time when artistic depictions of halos were diminishing. 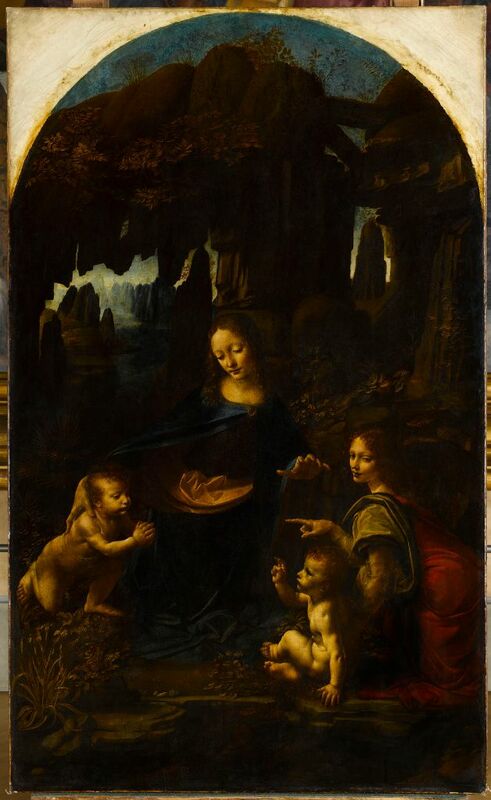 The confraternity may have requested da Vinci to emphasise their divinity in this version, particularly with reference to Mary’s birth without original sin. It is possible to sit on the benches between the paintings and play ‘spot the artistic difference’. Visitors should also make time to see the unfinished St Jerome, the Maddonna Lia, the Madonna Litta and the cartoon of the Virgin and Child with St Anne and St John the Baptist (also known as the Burlington House Cartoon). On show is also the Giampietrino reproduction of The Last Supper, done to a similar scale. Although sold out, there are five hundred tickets available each morning, from The National Gallery, for that day’s viewing.